Own a Training Center - includes certifications for Lifeguard Instructor, Water Safety Instructor Trainer, CPR & First Aid Instructor, and much more. Fully Functional Turn-Key Business. Sign Up Now! American Heart Association CPR Instructor certification & American Heart Association First Aid Instructor certification. 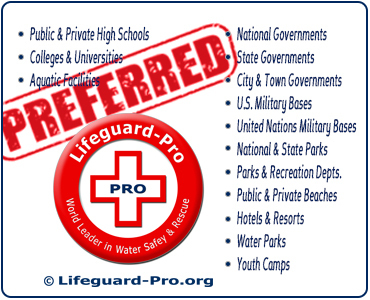 Priority customer referral status, which qualifies you to receive from Lifeguard-Pro the referral of paying customers to your Training Center. Yes, that's right, we even refer paying customers to many of our Training Centers! 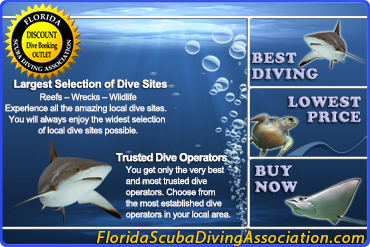 Let's take a closer look at each of the three Instructor certification options. Start Your Training Center Today! Our Lifeguarding Instructor certification course is all-inclusive. It includes all textbooks, videos, forms, exams, and materials for you to successfully complete your Lifeguard Instructor certification course. American Heart Association BLS certification courses (including American Heart Association CPR certification courses, American Heart Association First Aid certification courses, and American Heart Association Bloodborne Pathogens courses). That is right! When you become a Lifeguard-Pro Lifeguard Instructor, you also become an American Heart Association BLS Instructor! 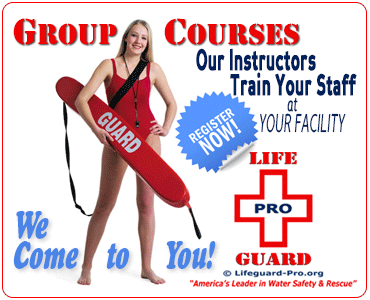 Start your Lifeguarding Instructor certification course today! Train Lifeguarding Classes in Your Local Area! Water Safety Instructor Trainer certification course. Our Water Safety Instructor Trainer certification course is all-inclusive. It includes all textbooks, videos, forms, exams, and materials for you to successfully complete your Water Safety Instructor Trainer certification course. What You Can Teach with Your Water Safety Instructor Trainer Certification. 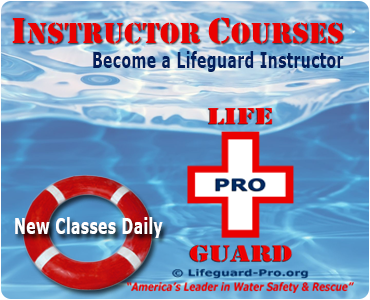 Once you purchase your Training Center, and successfully complete your Water Safety Instructor Trainer course, you will be authorized to teach Lifeguard-Pro Basic Water Safety certification courses and Water Safety Instructor certification courses. Train Water Safety Instructor Classes in Your Local Area! AHA CPR BLS for Healthcare Providers Instructor certification course. Our CPR & First Aid Instructor certification course is all inclusive. It includes all textbooks, videos, forms, exams, and materials for you to successfully complete your CPR & First Aid Instructor certification course. Train CPR & First Aid Classes in Your Local Area! Lifeguard-Pro Refers You Customers. When paying customers contact Lifeguard-Pro seeking certification courses in your local area, we refer those paying customers to our Training Centers on a priority basis. 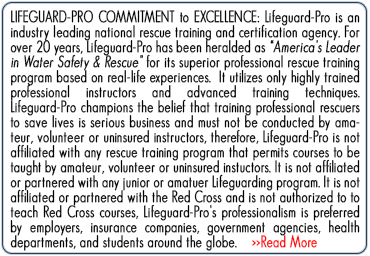 That's right, Lifeguard-Pro refers paying customers to our Training Centers! Start Your Training Center Today! You will proudly own and operate your own professional certification training business. 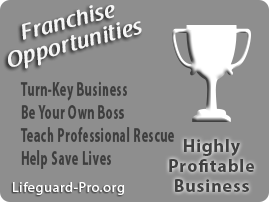 Lifeguard-Pro provides you with a fully operational turn-key business. We will guide you with our quality assurance guidelines to boost your credibility, professionalism and success. We provide you with marketing resources and services to promote your success. We even refer paying customers to many of our Training Centers! 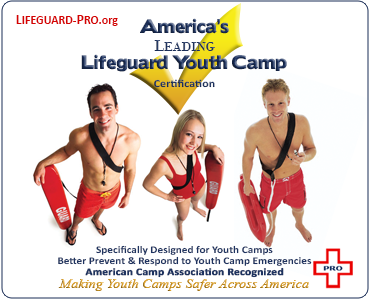 As a Lifeguard-Pro Training Center, you will not only operate a business, you will also be able to take pride in knowing that you will be helping Lifeguard-Pro in its mission "to reduce the number of deaths by drowning worldwide." 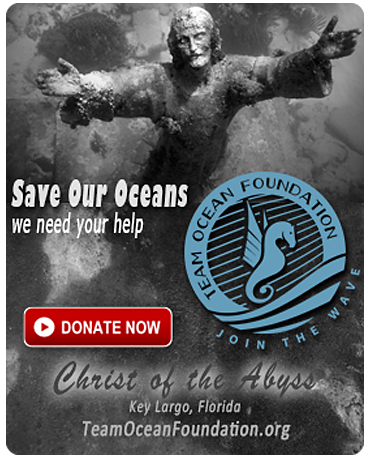 Become a Training Center Today! Contact Us.